Juice the lemons; this will yield about 1 cup of freshly squeezed juice. In a blender, combine lemon juice and blackberries and blend until pureed. Strain mixture and discard seeds. 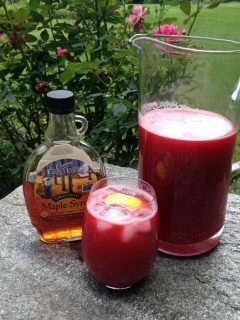 In a pitcher, stir together Maple Syrup, blackberry puree, and add 4 additional cups water. Refrigerate until cool or add ice cubes to individual glasses to drink sooner. Serve with a wedge of lemon.